At a well-attended meeting at the Rotary Club of Baytown on Wednesday, October 25, 2017, I had the distinct pleasure of speaking to this amazing Club. 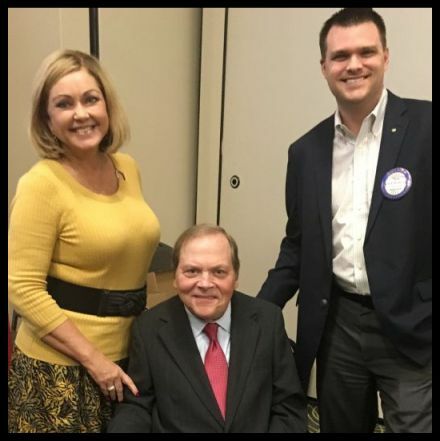 Sheila Crawford (Club’s President-Nominee and Executive Vice-President of BDI Resources), Jack Emmott and Nick Woolery (Club’s President and Assistant to the City Manager, Baytown, Texas). In 1985 when the PolioPlus Campaign started there were over 400,000 cases around the globe. This is astonishing since the polio vaccine was invented and administered in 1955, more than 30 years earlier. As of July 2017 there were just 7 reported cases in the world in just three countries. Tuesday, October 24, 2017 was World Polio Day. If you have the time please view the YouTube video which will remind you of the devastation and loss of life which polio has caused, will enable you to see how polio survivors have thrived beyond paralysis and show how blessed you are that you and those you love will never have to face this epidemic again. Bill and Melinda Gates and their Foundation have joined Rotary is getting the Campaign over the finish line. To the Rotary Club of Baytown I celebrate your service to community and the needful world. I pray that your Club and its members continue to flower in your work, now and in the future. I will definitely come again if asked to speak. Jack H. Emmott is a Senior Counsel of Gray, Reed & McGraw, LLP, a 120-lawyer full service firm in Houston, Texas, a Board-Certified Family Law and Master Credentialed Collaborative Law Professional Divorce Attorney, Mediator, Author, Entrepreneur and Inspirational Speaker. For more information about Jack or his latest book, Bending Angels: Living Messengers of God’s Love, go to BendingAngel.com.